The adorable puppy has grown into a beast that would frighten you if it hadn't been raised around humans and trained. 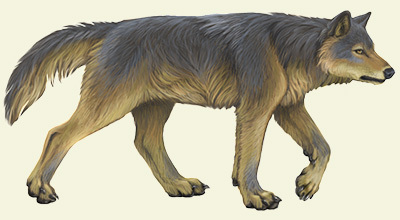 Larger than any normal wolf, this direwolf is muscular and physically intimidating, with a dark coat and a cunning mind. It often takes off on its own for many moons, returning only when ready. Most at home in forests, direwolves can guide magis to the most hidden dens and lairs, and being larger than any normal wolf is an extremely capable defender. Found mostly in forests, direwolves are rarely seen. They live in secrecy far from humans, and eggs are extremely difficult to locate and take. Direwolves are vicious if not raised around humans and are one of the strongest companions a human can have. Trained properly from birth, however, a direwolf is a loyal and fierce companion.